PRESS RELEASE– Empire City Casino, in partnership with the New York Rangers, will host NY Rangers legend and fan favorite Mike Richter as he makes his first visit to Empire City Casino for the final Rangers Viewing Party of the season Sunday night, March 12 at 7 p.m. NY Ranger fans can join Richter for the free Viewing Party to cheer the team on as they take on the Detroit Red Wings, and enjoy Rangers Intermission Trivia, prize giveaways, along with specially priced wings and beer. Fans can arrive to the casino in-style with free round-trip transportation from Madison Square Garden on the Rangers Bandwagon. Reserve your seat and ride along with the Rangers Blue Crew who will test fans with trivia for a chance to win autographed Rangers gear, hockey equipment, and more. 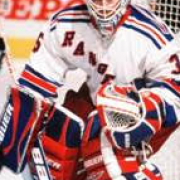 Mike Richter spent his entire career with the Rangers. His acrobatic saves and quick reflexes helped the Rangers win their first Stanley Cup in 54 years back in 1994. Richter’s number 35 was raised to the Garden rafters and retired in early 2004. Richter is the fifth and final NY Rangers legend to root for his team from Empire City Casino this season; Stéphane Matteau, Adam Graves, Nick Fotiu and Steve Vickers hosted the previous viewing parties. Fans from all over the tri-state area are encouraged to reserve their free seat on the Rangers Bandwagon, which departs from Madison Square Garden (outside Café 31, 220 W. 31st St. between Seventh and Eighth Ave) at 5:15 p.m. on Sunday, March 12. The ride features the Rangers Blue Crew and the chance to win NY Rangers gear and giveaways, and arrives at Empire City Casino at 6 p.m., just in time to spend some quality hockey time with Richter. Email EmpireCityCasinoViewingParty@msg.com to reserve your free seat on the round-trip bus.